He is Iraqi. He is Assyrian. He is the head of the Chaldean Catholic Church in Iraq with a direct line to the Pope. The Chaldean leader officially known as Patriarch Louis Raphael I Sako squared off against Saddam Hussein, ISIS, and the persecution of Christians in the past. Now, at a time when so many are fleeing to Europe, he’s speaking out about the need for Christians to stay in the Middle East. Sako, who is committed to helping make peace in Iraq, can see a very real risk that the Middle East will be emptied of Christians, and is against any efforts to encourage emigration except in situations of true persecution. In order to have impact, there must be presence. “Everyone is losing out. Those who are most able are leaving and they are the only ones who could rebuild all that has been destroyed in recent years. When asked about solutions to the current situation, Sako was clear—there is no “magic button”. 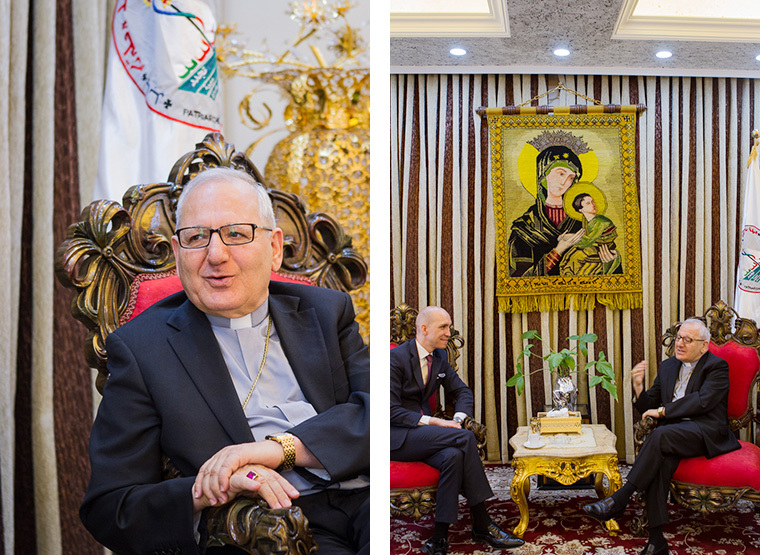 Photos from our meeting with Patriarch Sako in April.